This started out as an experiment. I had tried other recipes for peanut butter cups, but they never tasted quite right. My husband said they just weren't "peanutty" enough. So like the proverbial mad scientist, I went into the kitchen, determined to make a more "peanutty" peanut butter cup!! After a couple of tries, I made some ingredient adjustments and came up with this recipe. I recommend you use a high quality milk chocolate, but it must be tempered. If tempering chocolate seems too intimidating, you can use milk chocolate flavored candy melts. Grind peanuts very fine in a blender or processor. In a bowl, Mix together ground peanuts, peanut butter, butter, salt and brown sugar. Add Powdered sugar and incorporate until you have a nice dough, about the same feel as a pastry dough. If it is too crumbly, add more peanut butter. If too soft, add more powdered sugar. Roll out on a silicone mat or wax paper about 3/8" thick. Using a 3/4" circle cutter, cut out patties and set aside. Use only what you need. Wrap remaining dough in plastic wrap and refrigerate. 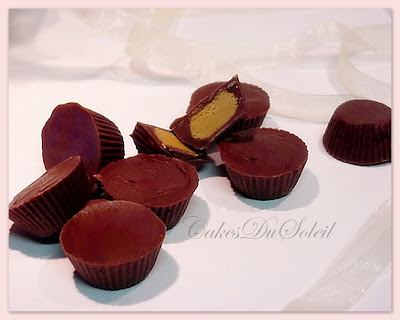 Fill a medium sized Peanut Butter Cup mold almost half full with milk chocolate. Using a stiff artist brush, paint the chocolate up the sides of the molds. Place peanut pattie in each cup. Drop enough chocolate over the top of the patties to fill cups. Lightly tap mold on counter to remove bubbles. Place in freezer for 5 minutes. Pop out of mold. Wash mold and repeat process. 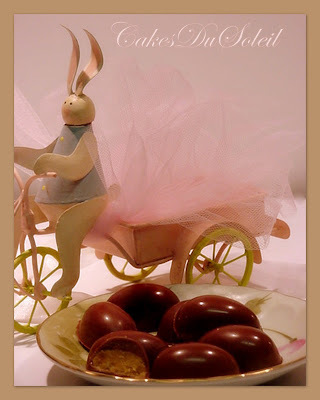 For Easter Eggs, use a chocolate egg mold. Form the peanut butter centers into ovals instead of round. Follow the directions as shown above. Pop out of mold for your own Chocolate Peanutbutter Eggs. Now if you want the Easter Bunny to deliver these, you will have to hide them!